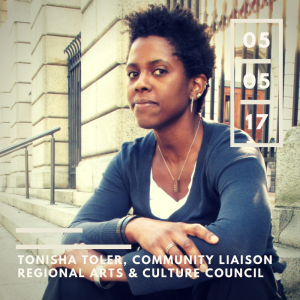 The Emerging Leaders in the Arts Network is thrilled to host our upcoming Visiting Practitioner Tonisha Toler, Community Liaison for Regional Arts & Culture Council in Portland, OR. She coordinates various RACC outreach efforts and builds and maintains community relationships. Tonisha focuses on exploring and developing engagement efforts and systems for reaching targeted audiences to increase diverse populations’ access to RACC services. This work contributes to RACC’s overall commitment to building a broader constituency especially with communities of color and other diverse populations. Additionally, she manages all aspects of the annual Artists Professional Development Workshop series and the quarterly creative community networking event, Art Spark. Toler will be joining us on Friday, May 5th from 11:00 am-1:00 pm in the private room at Falling Sky EMU. During her visit, Toler will present on her own work with Portland Art Spark, outreach strategies for diverse communities, marketing to targeted audiences, and implementing equity in arts and culture organizations. She will engage participants in a small workshop and discussions around these topics. Bring your questions! There will be free food, so please join us for this exciting lunchtime event!